Answer: Dry it out and use it in cookies or in these chocolate almond truffles! I have been asking myself this question for weeks now – I hate wasting food – and I finally came up with this idea. I don’t think I am the first person but that is why I have this blog. Generally, I spread the pulp out onto a baking sheet and let it sit out to dry out all day. You can also place the baking sheet in the oven at the lowest temperature (my digital temp is 170) for a few hours. Either way, run the dried pulp the food processor to break it up and then store it in an airtight container in the refrigerator until ready to use! Great idea! I’ll also blend it into smoothies for a thicker consistency. Great idea! I love your suggestion to use it for something sweet. 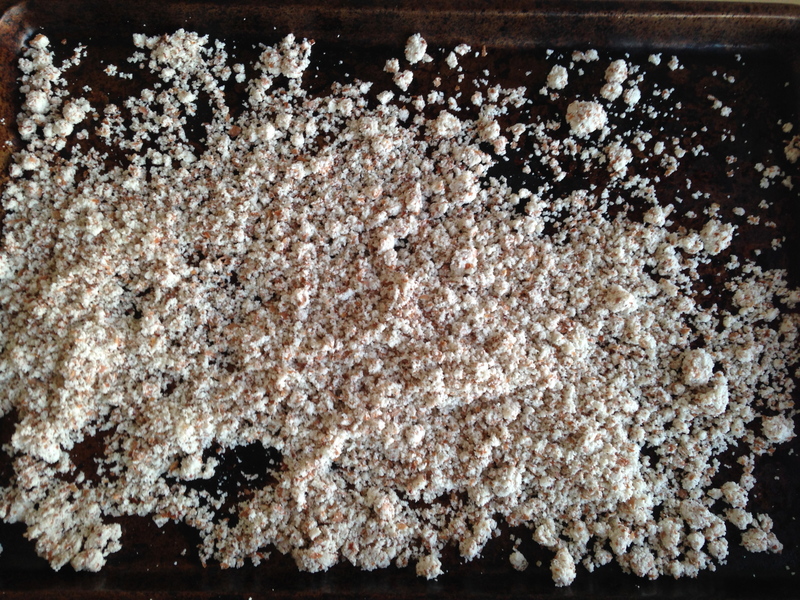 I also like to bake the pulp with a little sea salt to make a substitute for breadcrumbs. It’s great as a soup topper, or in place of other grains in veggie burgers. Thanks for the idea!